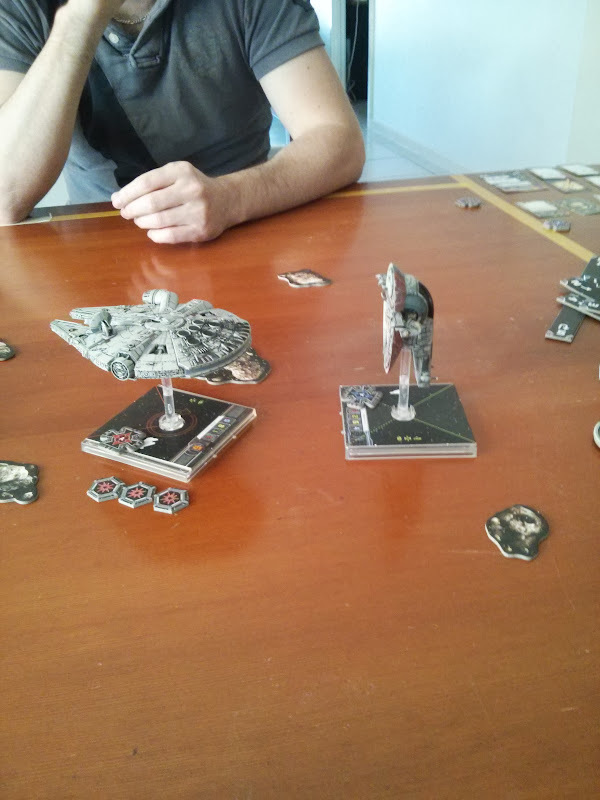 Weekend Games – X-Wing again! 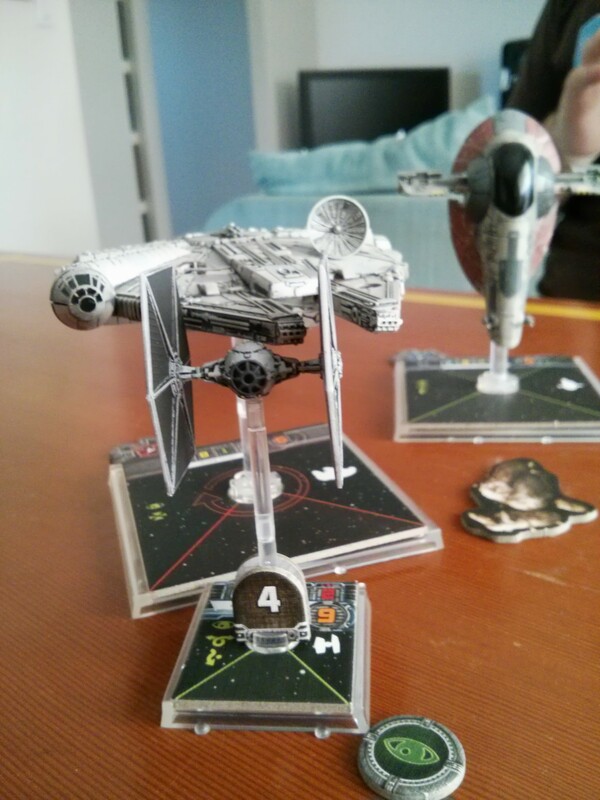 I quite like X-Wing Miniatures, but really I’m just trying to get my money’s worth out of them. I had a couple of games with my brother again. We take a novel approach to force-building. First we randomly pick a side, and build a 100-pt force for that team. Then, we randomly pick which team we play… so you only have a 50-50 chance of actually playing the side you built. This works pretty well because you have to take a fairly serious approach to building the force, as you might end up with it … but at the same time you can afford to play around a bit, because you’ve only got a 50-50 chance of having to play with your own crap. So I built the Rebel Alliance and I decided what would be cool would be Luke Skywalker in an X-Wing, then Han Solo and Chewie in the Millenium Falcon. I built Luke quite defensively, and Han quite offensively both had maximum bells and whistles. 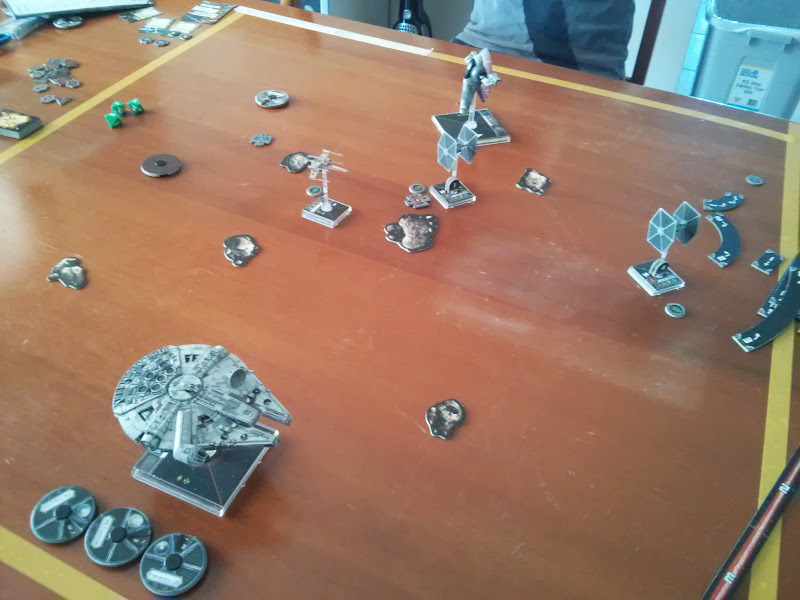 My tactic was to try and keep Boba Fett at range so he could use all the missiles and bits and bobs Scott had saddled him with, and use the two TIE fighters as bait. So I swung a path through the asteroid field that took me generally away from Han and Luke. I had planned to drop a mine somewhere there in the hope they’d fly into it when trying to follow me, but I totally forgot. The bait worked well enough. 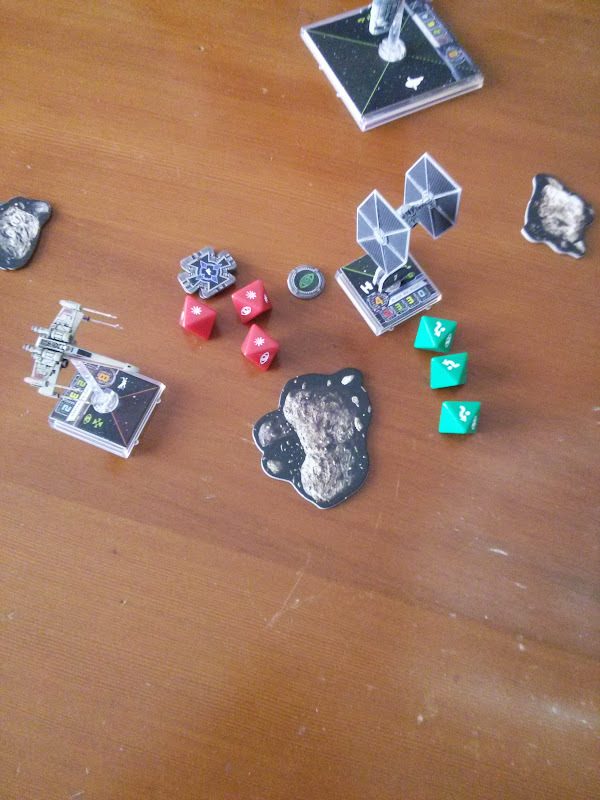 The no-name TIE fighter came under heavy fire and was all but destroyed… when, on 1 hp, he pulled off an amazing 3 evades vs 3 hits that kept him alive one crucial round longer. He used that turn to pull out of range, and Dark Curse became the target of choice. Meanwhile, Boba Fett had looped around and started to unload missiles and heavy cannon fire. Luke was the first to blow up due mostly to Boba Fett’s fire, but Dark Curse got in some key hits as well. In fact, Luke was having so much bad luck I’m not at all convinced the force was with him one little bit. Shortly afterwards 1-hp “Black Squadron Pilot” came back into range and Han finished him off. We were 1 loss for 1. Great odds for the empire. 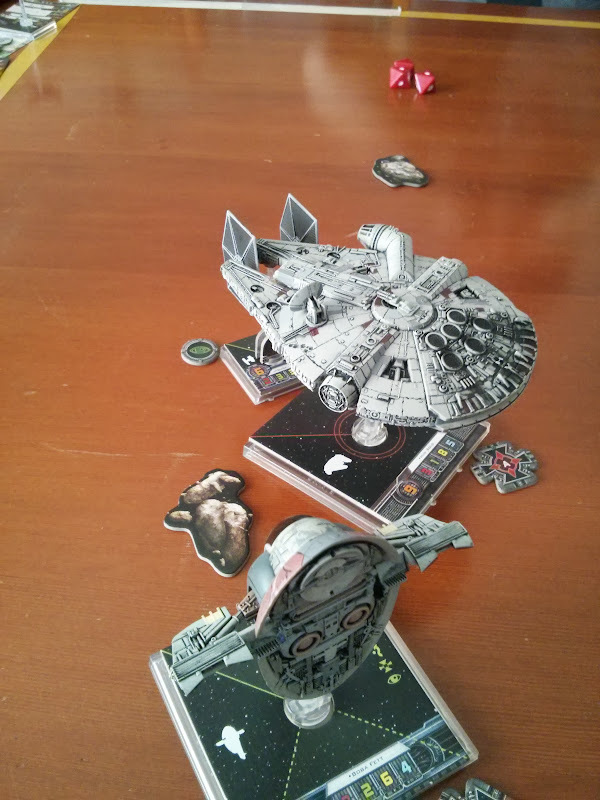 As the fight drew on, I spent several turns hot on Han’s tail, shooting him with my primary weapon. 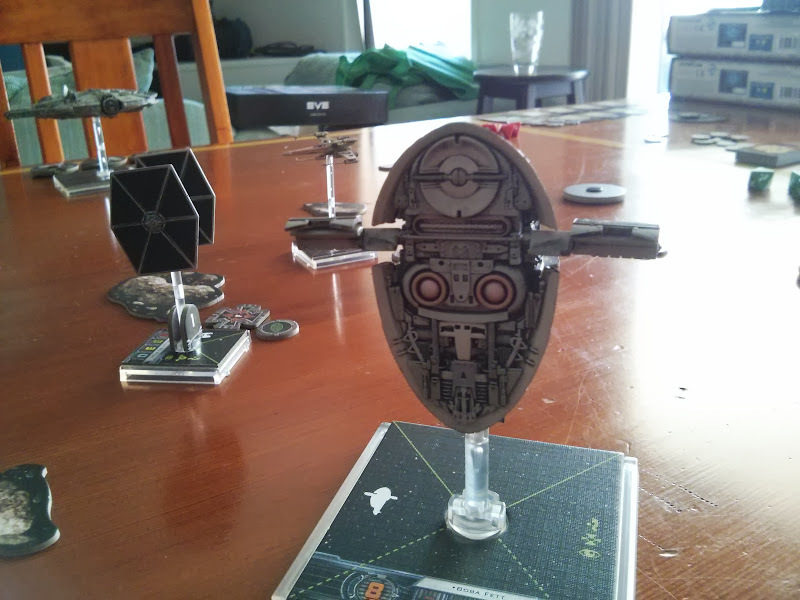 I had him locked, but was saving it for a proton torpedeo – if he ever pulled away that is! Dark Curse had over-shot the Millenium Falcon and was weaving back and forth in front of him slowing him down a lot. In fact, things got REALLY tight there between Dark Curse and Han several times. With some breathing room Boba Fett did a Koiogran turn which put him out of range but the up-side was that he’d soon be able to fire the proton torpedeo. Han, meanwhile, was able to dispatch Dark Curse with that same breathing room. Things were pretty even with Dark Curse gone, but in the same turn Han dispatched the final TIE, Boba Fett fired the proton torpedo, and it did tons of damage to the Falcon. Due to the sustained damage, and that final hit, Han ended up having something like 4 damaged components. His agility had been reduced to 0, he couldn’t do any red manoeuvres without risking damaging his ship further, his console was on fire (potentially adding 1 more damage each turn until the fire was extinguished) and he’d been nailed with a direct hit which counts as 2 damage. Slave I and the Millenium Falcon passed each other head on. Han shot with his 360-degree turret, but although it brought Boba Fett’s shields down, it did no damage. Boba returned fire with his rear-firing gun, and blew Han Solo away. Empire wins! ← EverQuest Is Making A New Game. And I Care Because… Oh. Oh I see. To my knowledge Slave 1 can’t shoot backwards. It certainly can! The new rules come in the mini’s box. You can see the reverse firing arc as dotted lines on its base. If you own Slave I you’ve got a whole new way to play now!